MEMPHIS -- It looked as though the Thunder was going to glide into the All-Star Break with an easy road victory, even on the second night of a back-to-back. The Memphis Grizzlies had no intentions of letting the Thunder off the hook that easily. Thanks to a 23-2 run midway through the second quarter, the Thunder racked up a 22-point lead early in the third quarter. The previously blistering hot offense sputtered a bit with Steven Adams bothered by foul trouble, shots stopped falling at the incredible clip the had in the first half and suddenly, the Thunder had a dogfight on its hands. In fact, the Grizzlies clawed all the way back to just one-point behind on two different occasions, at 104-103 and at 115-114, the latter on a banked in fadeaway three-pointer by Tyreke Evans. The Thunder, after landing in Memphis at 2:00 a.m., had a response each time, and ended up dashing into the All-Star Break with a 121-114 victory. 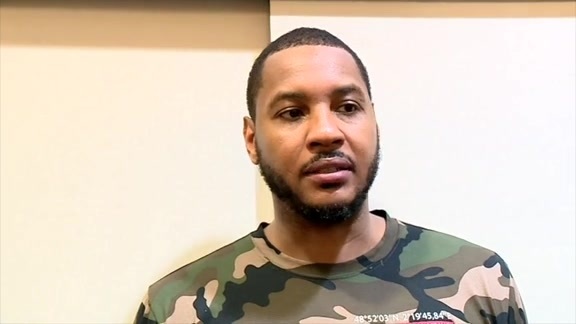 Forward Carmelo Anthony hit the two most important shots of the game. First, a nearly impossible pump-fake, one-dribble pull up jumper to free himself up for just enough space to separate to 106-103, then a contested catch-and-shoot three-pointer on a pass from Russell Westbrook with the shot clock winding down to make it 118-114 with just 25 seconds remaining. Thanks @carmeloanthony, that made it 17 three-pointers... a Thunder record ladies and gentlemen. On the ensuing Grizzlies possession, Westbrook sprinted over from the weakside to block Evans’ layup attempt off of the Memphis guard and out of bounds. Three Westbrook free throws later, and the Thunder was off for a week with a smile splashed across its face. It wasn’t just Anthony (19 points) and Westbrook (23 points, 15 assists, 13 rebounds) who saved the day for the Thunder. There were a variety of characters who made an impact. 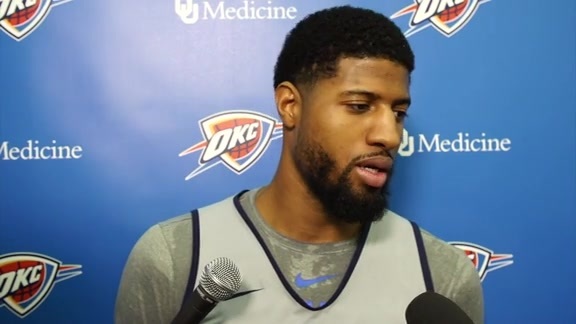 The most prominent was Paul George, who had an outrageously good first half where he scored 22 points on 8-for-9 shooting, including a 5-for-6 mark from the three-point line to extend his streak of games with 5-plus made threes to an NBA season-high-tying five games. George wasn’t alone as a marksman from behind the arc for the Thunder. In fact, Donovan’s club broke an Oklahoma City record with 17 made three-pointers, including three by Patrick Patterson off the bench. After taking zero shots on Tuesday night against the Cleveland Cavaliers, the Thunder made a concerted effort to put Patterson in must-shoot situations. 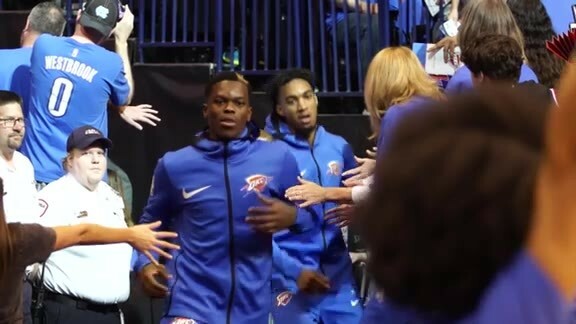 With veterans up and down the lineup, the Thunder was able to keep an even keel, but Oklahoma City couldn’t have won this one without rookie Terrance Ferguson, who didn’t even play in the first half. Inserted into the rotation for 10 minutes in the second half after a left hip contusion knocked out Alex Abrines, Ferguson was lights out. Ready for his moment, Ferguson played effective defense and made all three of his shot attempts, including a gutsy driving layup and two corner three-pointers, all in the fourth quarter. This win was reminiscent of the Thunder’s season through the first 59 games of the season - intense, impressive and inconsistent. Donovan knows what his team can do when it plays at the elite level it showed during that massive second quarter burst tonight. The key coming down the home stretch after the All-Star Break is bottling up that level of execution on both ends of the floor and unleashing it every night, for 48 minutes. “We could be better on both ends of the floor in that second half, and that’s the consistency I think we need to keep fighting for,” Donovan stated.